Last week, we asked you about games with multiple endings. Now to be fully honest with you … I have some preconceived notions about Multiple Endings that come from my own experience. This is because, the moment a game clues in that it’s going to have multiple endings, Google pops open and, by some magical force that I cannot control, starts searching for the ending conditions that the game has. Obviously these are spoilers–made even more terrible by the fact that games with multiple endings tend to be story focused–but how do you resist? Who wants to play a 60+ hour RPG only to get the bad ending? Persona 5 is trending today, looking great (as always), and I’m just wondering how you’re supposed to handle not knowing every path one can take before picking up a copy of a new game. What if you get the wrong ending? Who’s going to play all over again just for the better ending? A whole lot of you, apparently! 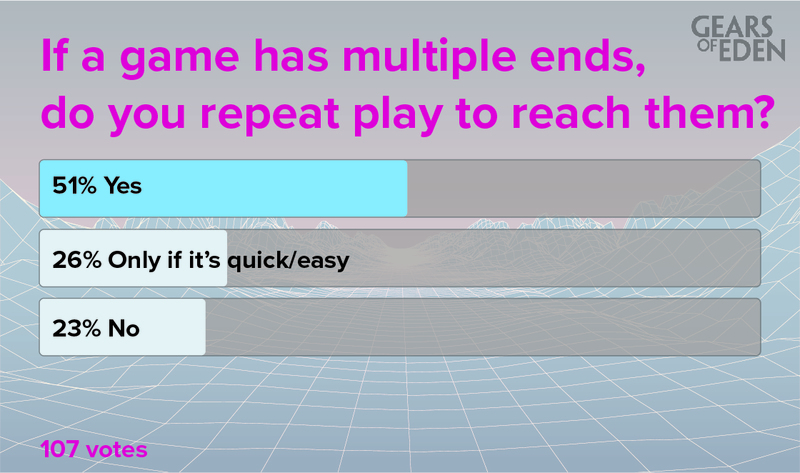 In the poll, just over half of you said definitively that yes, you’ll play a game multiple times to experience all of its endings, and then another fourth of you will get those multiple endings if it’s fast or easy enough. (Like how in Deus Ex: Human Revolution, you can save before choosing the ending you want.) That’s over 75% of you! Usually with polls we can kind of predict how things will turn out, but we were completely surprised by these results! I myself had always assumed the multiple endings only existed as a present to the most die hard of fans! What does this mean for Gears of Eden, then? I’m not sure yet. As the team’s lead writer, I want to make sure that if we do multiple endings, it’s properly implemented and fits in with the narrative that we’re going for. I never beat Mass Effect 3, but we all know how jarring that ending felt to most of the audience. So I have a request for you! If you’re a fan of games with multiple endings, send me some suggestions of your favorites that I might want to try for research! We all want to make sure Gears of Eden is the best game that it can be, and if that means playing the same game over and over, I’m all for it. It’s hard to escape the fandom around the Nintendo Switch this week, so we are asking what you think about this latest of consoles. Our focus for GoE is on PC right now, but down the road… one day… who knows? That’s all for this week’s Fan Feedback, but I’ll be back with another Dev update in a couple days to tell you about some huge developments in Gears of Eden! If you want to read all about that, be sure to follow us on Twitter or Facebook to get it on your feed the very moment that it’s available! Thank you so much for reading and participating, I hope you have a great rest of your week.